Ready for some high-tech floor cleaning? Check out our 2019 reviews and ratings of the best floor mopping robots. 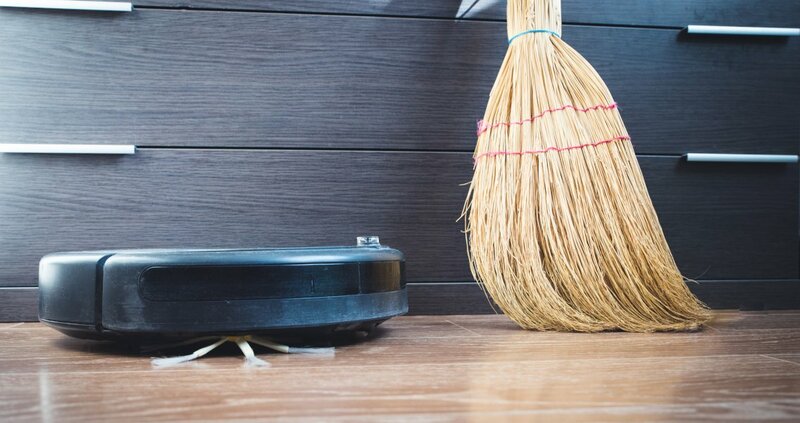 Who doesn’t want to automate cleaning, especially mopping? 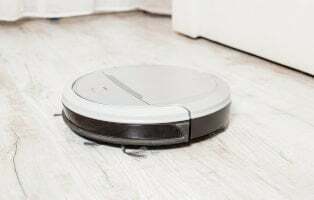 Before you rush out to buy the best robot mop on the market, you may want to browse our 2019 reviews of the top sellers. Not all mopping robots are created equally. They’re also not quite as advanced as robotic vacuums…yet. Even the best robot mops have some growing to do with features and performance, but they’re getting there fast. Some of the current models are friendlier on delicate surfaces such as wood floors. Instead of only a strong jet of water which can damage wood, some robot mops now use a slow drip with microfiber cloths. Some even act as dust mops or as hybrid vacuums + mops. When looking for a robotic mop, keep in mind that the tech isn’t on par with robot vacuums, especially when it comes to smart navigating and timed schedules. Robot mops with water tanks are a bit more challenging because volume is limited, so large rooms may require a couple of refills. For true “automation” during a workday, for instance, it might not clean your whole kitchen or family room, but could tackle the foyer or a bedroom or bathroom. Larger spaces will require some babysitting. The vacuum/mop hybrids may not perform as well as a single-function machine. This is true for most household cleaning tools. So these are best used for light, maintenance cleaning to take care of daily pet shedding and food splatters. The good thing about hybrids is, they’re kind of a testing ground for new tech. Some of them can be controlled with apps or voice control over Alexa, and some can interact with other smart home devices. Battery life – Robot mops for large rooms should have batteries that last around 90 minutes. Sensors – They should be able to sense obstacles such as walls, rugs, and carpeting. Setup – The simpler it is to charge, program, and fill water tanks, the better. 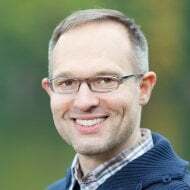 Apps – If available, are they intuitive? What are the benefits? Performance – Under real-life situations, it should clean various surfaces without damaging them and pick up lots of grime in the microfiber cloth. For half the price of a Roomba vacuum, you get a good hybrid vacuum/mop that works well on hard floors. Best for light maintenance cleaning of hard floors, but not heavy-duty cleaning. Pretty basic, compact machine with minimal tech. Good remote options via Alexa and apps, better vacuum than mop. 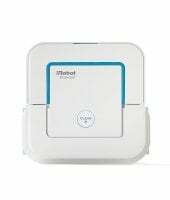 A true automatic floor cleaner you can run from anywhere. For light cleaning of hard floors, this little guy delivers for a good price. It’s a good starter robot mop. 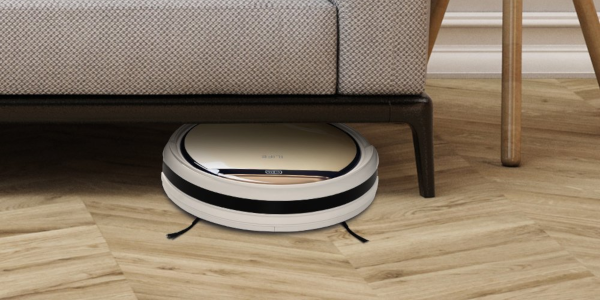 If you’re a tech lover already using floor robots, you’ll want to try this one. Just don’t expect a mopping miracle. 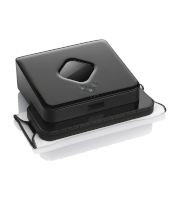 4 cleaning modes, quiet motor, 140 minute battery runtime, short profile to fit under furniture, 2 levels of filtration. Super quiet, compact, 210 min dry runtime, 150 min wet runtime, fully charges in 2 hours, uses disposable or included cloths. 500 mL dustbin, up to 2 hrs runtime, quiet, great for pet hair, Alexa voice & smartphone controls, 5 cleaning modes. Small profile fits into tight places, runs up to 6 hrs. in dry mode, 2 hr. charge time, precision jet spray, vibrating head. Integrates with app, Alexa, & Google home; floor mapping, great at vacuuming, carpet detection, several cleaning modes. Random floor pattern, poor user manual, no room mapping, small dustbin, may topple over stairs, can leak if left to sit. No automatic scheduling, can’t find charging base on its own, not effective on heavy dirt or large spills, carry handle in odd place. Can get tangled in wires easily, doesn’t do well with grout or Berber, may have trouble finding charging dock, requires quite a bit of hands-on maintenance. No reusable pads included, no automatic scheduling, small(ish) water tank, not suited for large areas, poor obstacle avoidance. Mopping power comparable to cheaper models, app may not connect well, small dustbin & water reservoir. This may be one of the only hybrid mop/vacuums that can give Roomba a run for its money for about half the price. The V5s Pro is a smart device that is good for light sweeping and mopping hard floors without wasting water. It’s an upgraded version of the V5s with new i-dropping tech that is more efficient and has a longer battery life. Larger wheels also improve its navigation over uneven floors. The V5s Pro is quieter than older models at around 55- 60 dB. A single battery charge lets it run about 140 minutes and it recharges completely in less than 5 hours. It finds the charging bay well and returns within 10 ft. away. At only 2.8 inches high, its short profile helps it get under low furniture. Two levels of filtration capture 99% of all dust particles, allergens, etc. Its 4 cleaning modes help customize cleaning. There’s no motorized brush, so it can’t clean carpets. The small dustbin means it’ll need to be emptied often. There are no room mapping sensors, so its pattern is random until it runs out of battery. It can sometimes get stuck behind objects and die before making it back to the charging dock. The suction power hasn’t improved over older models. Water can seep out and leave a puddle if left to sit too long. Customers were happy with how this picked up pet hair and dust. They liked that it was gentle on furniture. They liked the timer function and quiet motor that lets it run overnight without disturbing them. Some thought the manual wasn’t clear on how to use the mop function. The random pattern ended up leaving areas of floor neglected in some situations. For a few customers, it ended up falling down stairs instead of avoiding them like it’s supposed to. This little mopping robot is built for maintenance cleaning only. There’s no brush roller or dustbin. It comes with a microfiber cloth but is also designed to work with disposable Swiffer-style cloths for wet or dry modes. It’s not a heavy-duty cleaner by any means, but for just everyday dust and damp mopping to keep floors tidy, it’s good at what it does. Still cheaper than a Roomba and more compact. This little guy has an impressive battery run time of 210 minutes for dry mode (up to 1000 sq. feet) and 150 minutes in wet mode (up to 350 sq. feet). It fully charges in 2 hrs, weighs just 4 pounds and is 8.5 inches wide. Wet & dry reusable cloths are included, but can also use disposable cloths. It relies on a separate NorthStar navigation cube to map the area so it can clean accurately. While the carry handle is good for transport, it’s actually on the side that fits into the vertical charging port, so you can’t lift it to and from the port with that. It also can’t find the port on its own, so you’ll have to do a search & rescue after every run. You can’t schedule automatic runs either, so you’ll have to babysit it while it works. Customers love that it’s so quiet and compact enough to get under/between furniture and avoids throw rugs well. They love it for everyday dust control. Though good at catching light dust/hair even in corners & edges, for heavier dirt, customers found it just pushes it around. It can handle light spills and sticky stains, but for large spills, the pad gets saturated quickly and can’t soak up all the spill. This high-tech hybrid robot mop uses Alexa voice and app controls to start/stop cleaning, select modes, schedule runs, monitor status, and get alerts. It’s an upgraded version of the Deebot N79 robot vacuum, with a larger dustbin, added mop function and longer battery life. It’s designed to clean both hard floors and low-pile carpets/rugs. For all the high-tech amenities, it’s really affordable, but still more hands-on than you’d expect. The larger dustbin on this model (500mL) means more time between emptying. It’s still fairly quiet at about 56 dB. A full battery charge lasts about 110 minutes, and it takes 4-5 hrs to fully charge. Anti-drop and bumper sensors keep it from falling down stairs and banging into furniture. Besides the Alexa and app controls, what’s really nice are the 5 cleaning modes from regular to edge and intensive for heavier-duty cleaning. Unless there’s a clear, wide path to it, this guy may have a hard time finding its charging base. It may still bump into things even with the sensors. Larger dirt & debris can be a problem for it to pick up. Before you run it remotely, you may want to make sure there aren’t any loose wires about, or it could get tangled. There’s no voice report, so you have to troubleshoot with error codes or the mobile app. Customers report that the M80 Pro can run about 2 full hours instead of 110 minutes. They love the automatic scheduling to run it any time of day. It worked great at picking up pet hair. The mop function proved to be a disappointment on tile with grout lines. On carpet, it doesn’t do well with Berber or anything besides low pile. Switching out pads, cleaning filters, and emptying/filling reservoir was annoying for some. This may be the little mopping robot that could. It only mops, but can do either dry, damp, or wet mopping. Don’t expect miracles. It’s still pretty light-duty, but it acts more like a trigger spray mop and moves like one too. 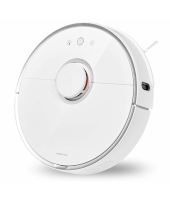 It’s the cheapest product iRobot makes, but it does its one job pretty well. The Braava is pretty smart too with good navigation and a smartphone app for basic controls. The Braava is super compact at just 6.7” x 7” & about 3” tall. It fits behind some toilets and other areas that its big brothers can’t. The square shape helps clean corners and edges better than the round boys. Precision jet spray & vibrating cleaning head helps remove stains. Virtual barriers keep it from wandering too far. It knows which mode to use from the cleaning pad that’s on it. It charges in about 2 hrs and cleans 150 sq. ft. (wet) or 200 sq. ft. (damp or dry). The Braava isn’t meant for large areas. It doesn’t come with reusable pads (only disposable), but they can be bought separately. It’s not meant for heavy-duty cleaning or big, stuck-on stains. There is no automatic scheduling, and no auto docking, but it will return to its starting spot. The battery must be removed and plugged into a wall charger. It doesn’t avoid objects well and can bump into stuff repeatedly. 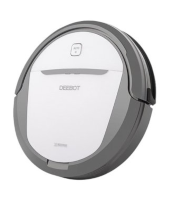 Customers love the price & say it’s a good starter robot, though it’s pretty much an automatic Swiffer. They like the long battery life (up to 6 hrs for dry). Damp & mop pads are treated with a cleaner that can streak darker floors. Customers felt the water tank was too small and needed refilling too often. It won’t always connect to the app, which was annoying for some. The Roborock S5 competes well with the big boys in function and performance. It’s expensive, but for all it does, that’s not surprising. 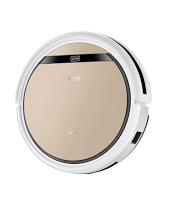 This is an upgrade over the Mi Robot Vacuum – quieter with added mop feature, increased suction, carpet detection, washable filter, and larger dustbin. It’s a tech-lover’s dream, but for the high price and mop function comparable to the others, we placed it lower in the ratings. If you already love robot mops and can pay more, it’s a great choice. The Mi Home App allows scheduling, zone cleaning, direction controls, real-time monitoring, etc. It’s compatible with iOS, Android, Google home & Alexa. 13 smart sensors help it map out a room to plan an efficient route and avoid things like wires, while climbing over or pushing small objects aside. Improved vacuum performance means it automatically detects when it’s on carpet & increases the suction. Six cleaning modes can tackle most floors except for shag carpeting. It can run about 150 minutes. If you had to give grades for performance based on price, vacuuming would be an A, while mopping would be a C+. The water reservoir is quite small (140ml) & must be added for each mopping. Pad must be cleaned often. Changing the water tank means picking up the machine whereas some have top access. Bugs in the app sometimes make it forget the floor map and boundaries you’ve manually set. Some people had issues getting the app to connect, though firmware updates may be coming soon. Customers are a lot happier with the vacuum function than the mopping. They like how it transitions to various floor types well and the improved suction power. Some found the mop worked better with Swiffer Wetjet solution. Some customers thought the dustbin and water reservoir were simply too small. They had a lot of issues with connectivity with the app. To robot mop or not to robot mop. That’s the question of the day. In our tech-loving time, we’re always looking for the next cool gadget we can control with an app or voice commands. Robot vacuum and mop developers are listening. As more models arrive on the market, more improvements and innovations are coming while the price is decreasing. Where at one time, you couldn’t find a robot vacuum for less than $1000, you can now get a hybrid model for under $200. However, as we’ve said before, the multi-taskers are kind of hit or miss. They’re often jacks of all trades, but master of none. Certainly, hybrids have come a long way and continue to do so. But usually they are a bit lacking in one mode or the other. Don’t expect heavy duty cleaning machines in any of these. They’ll never quite replace the cleaning power of a mop and bucket. You will always be better since you have almighty elbow grease and a smarter brain. So why even buy one? Convenience! Very few June Cleavers exist today. 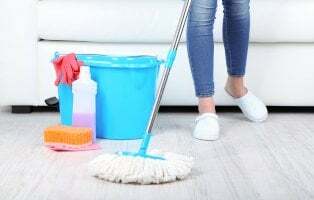 Even full time moms are busy with side jobs, children’s activities, volunteering, laundry, dishes, grocery shopping…finding time to keep floors clean is hard. We often wait until we’re wading through cat litter or sticking to Kool-Aid spots before we break out the cleaning equipment because it’s just so time-consuming and tiring. That’s where robot mops & vacuums can really save the day. You just have to be realistic. You shouldn’t wait until your floor is hidden under dirt to send these out. They’ll just make a streaky path through it, get upset, and go back to their dock to escape. These guys are meant for everyday, light duty maintenance. The best thing to do is, once you give your floors a thorough sweeping and/or mopping, THEN set these guys up to run on a daily schedule. That will lengthen the time needed between deep cleanings, which in turn will save you time, energy, and cat litter sticking to your feet. With these devices, there are less physical tips and tricks to use than with manual cleaning tools, but there are still some little hacks you can keep in mind to make your robot vacuum or mop your BFF. Wet it first – Yes, the robot mop will be continually dripping or spraying water as it goes (unless you want dust mopping only), but it will take a while for the cleaning pad to get wet enough to actually mop. By then, it’s made a few passes of just dry mopping. So, to give it a head start, spray the mop pad with cleaning solution or a water/vinegar solution before you turn on the machine. Stains need some TLC – No mopping robot will tackle really sticky or dried on stains as well as a mop. Take a minute to spray some cleaner or vinegar solution on those spots to pre-treat and soften them up for easier removal. One room wonders aren’t bad – Some people are annoyed if they have to refill the water tank or change a cleaning pad between rooms. Don’t be. This is NOT a bad thing. By the time your robot’s done with a room, the pad will be saturated with dirt. If you let it go off into another room, it’s just going to drag the dirt along and be unable to pick up new grime. Nobody likes streaks – You’ll probably see a few, especially on darker floors. So, opt for fast-drying cleaning solutions & always use distilled water. Same goes for steam mops. Read that manual – For some robot mops, you must only put water or a specific cleaning solution into the water reservoir. Make sure you follow those directions. It could void the warranty otherwise. 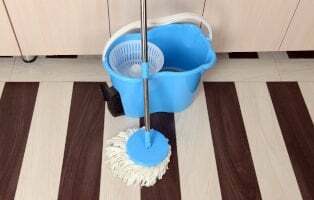 If you find it’s not cleaning well with plain water, try spraying an undiluted floor cleaner like Mop & Go on the cleaning pad to wet it first. We learn a lot from researching real customer reviews and testimonials. Homeowners care a lot about keeping their homes clean while holding down jobs and taking care of families. So anything that makes cleaning easier and less costly is right up their alleys. They’re great about relating what works as well as what didn’t work. From reading these experiences, we’ve discovered there are a few things that robot mops just don’t play nice with. Pay particular attention to these before you purchase and operate a robot mop so you’re not out $200 – $800 for a broken hunk of plastic. Most of us have a number of wires in our home for electrical and mobile devices. We don’t think twice about leaving them where they are on the floor if they’re not tripping hazards. Robot mops, despite their “smart” technology, aren’t really that smart. They’ll go right under the end table or behind the couch where they can easily get tangled up in the wires. Then you may lose both robot wire AND your charging cord. Those with brush rollers are especially bad at this. So, before you set your little mop loose, take a couple minutes to get all electrical wires and charging cables off the floor where the robot may wander. These pose a similar hazard to wires and cables, but aren’t always as obvious. Have a look around. Pick up any stray tennis shoes, ribbons, play jewelry, yarn, etc. If you or your kids have long hair, make sure you’ve given your floor (especially carpet) a good weekly/bi-weekly vacuuming so none of this stuff gets wrapped up in your robot mop brushes. Even the best high-tech robot mops with room mapping capabilities and drop off sensors can sometimes take a tumble down stairs. Carpeted stairs provide a better cushion, but any stairs have the potential of damaging your robot mop. The fall can also make dents in the stairs and wall on the way down. For safety’s sake, consider blocking off stairs with a baby gate or pillows while the mop’s running. This is specifically for your dedicated robot mops and hybrids. Some hybrids will vacuum well on low pile carpets and rugs. Some won’t. You kind of have to take them on a test run. They may not perform well on textured carpets like Berber. Shag carpet can simply stop them in their tracks. But give them a run on your low pile carpets & rugs and see what happens. They may go straight from hard floor to rug and carpet in vacuum mode easily. Or they may avoid them altogether. It’s the mopping mode that can cause an issue. Some robot mops are great with room mapping and virtual walls so they’ll stay off the carpeting. Others not so much. If you don’t want soppy rugs and a wet path through your carpet, you may want to pick up those rugs and block off carpeted areas with pillows. As we said before, robot mops and vacuums are smart(ish). They have one job, and that is cleaning your floor. They can’t quite determine which messes they need to leave to the warm-blooded primates with opposable thumbs. As admirable as their work ethic is, you really don’t want to run your robot mop as you sleep only to wake up to a floor covered with dog mess. Of course, you can’t always control those accidents when you have pets, but if you have a puppy (or toddler) you’re potty-training or an incontinent older dog, consider NOT running the robot mop or vacuum while you’re asleep or gone. Sure it’s less convenient, but you’ll save yourself a 3 AM nightmare. Homeowners are turning to automation more than ever to keep their floors clean. But should you jump on the technology bandwagon and buy a robotic mop? Discover the pros and cons of these smart cleaning devices. Do you really know how to mop hard wood floors? Take our quiz to find out. Wood floors need a bit more TLC than other hard floors. The wrong cleaners can dull them, hard shoes can scratch them, and water can warp them. Here are our tips to clean, mop, and maintain any wood flooring. Mopping isn't rocket science, but there are some tips and tricks to get the most out of that not-so-fun task. Here, we'll tell you some of the best ways to mop floors using spin and steam mops.